Oct 2/07 Hope to begin new updates soon!! Now 256 bottles pictured and described. NEW A page with bottles in 3 dimensions!!!! 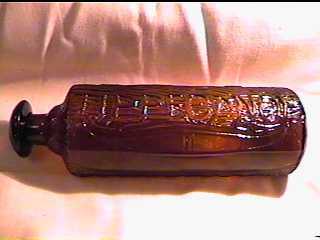 Hi, welcome to my page on antique bottles. This site is currently under construction and hopefully always will be. Why a page for bottles? Because it fills a need I have to explore early glass. Bottles collectors seem to embrace the hobby with a passion, a fact that becomes obvious when you talk to one. Many people look at my collection and find it cool or neat. A bottle collector has a different reaction, their eyes glaze over and they hold the bottle as though it was a living thing. Collectors know what I mean, so do their friends and spouses, who look at us with a smile of tolerance. I also wanted a page that would give the beginning collector some general information on the age and catagories of bottles, and what to look for. Bottle books, good ones at least, are becoming hard to find. The classics are becoming very pricey. So hopefully this site will be a starting point for new collectors. And for those of us already heavy into the hobby, I hope to give you some info you didn't know, and you can supply me with info I don't know (and there is a lot I don't know!!) Perhaps specialty collectors, such as bitters, can contribute a page. In short I would like this site to be a learning experience for old and new alike. A chance to share a remarkable hobby with fellow collectors. Thanks is extended to those who have allowed their pictures to be posted. I would ask that if you want to use the pictures on this site to ask first and I will ask those who have given me permission. They are not mine to give away, except my own. It takes time to take photos and we should respect the efforts of others. Thanks. If you would like to submit pictures and/or info you can email me: EMAIL and I will post them. A nice early stipple bottle. This 1853 black glass is a nice example of the art of stippling. More info is given under the black glass section. Photo compliments of Phil Culhane. Thanks for sharing.